You Are Here: Home » Practice Management » Should Superior Client Service be Your Differentiator? In any business sector, one of the biggest challenges is to differentiate oneself. For a variety of reasons, this is especially difficult in the accounting and valuation and appraisal field, where many firms struggle to find ways to stand out. In fact, most firms end up making essentially the same claims about what makes them different. In this article, Dr. Frederiksen discusses his findings and suggests ways to differentiate the services and land clients. In any business sector, one of the biggest challenges is to differentiate oneself. For a variety of reasons, this is especially difficult in the accounting and valuation and appraisal field, where many firms struggle to find ways to stand out. In fact, most firms end up making essentially the same claims about what makes them different. I must be exaggerating, right? Well, I recently did an informal survey of accounting firms in my hometown. Here are claims made by the first two firms that came up at random. At [name of the firm], we pride ourselves in providing a personalized service to each of our customers and invest in building trusting relationships. It is our goal to continuously exceed your expectations. If you are ready for a truly different level of commitment and personal service from your business advisors, we invite you to learn more about why [name of firm] has become one of [location’s] most trusted accounting, tax, and business consulting firms. You may have a hard time distinguishing between these two firms’ claims. If so, imagine what it is like for a client! It might (or might not) surprise you to know that in a survey my firm recently conducted, the differentiator that accounting firms use most often (in 63% of the cases) is essentially what these two firms claim: they provide superior customer service. Let that sink in for a minute. When more than six out of ten firms are saying they are different in essentially the same way, that is a problem. If only from a logical point of view, when that many firms say the same thing about themselves, then it cannot really be a point of distinction. But there are other, more strategic reasons why claiming superior client service as a differentiator is not wise. Consider firm growth. 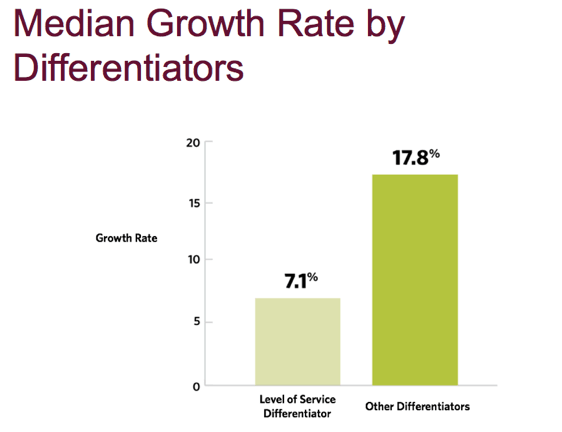 In another study my firm conducted, accounting firms that used superior client service as their lead differentiator had a median growth rate that was well under half the rate of firms that used any other differentiator. Providing superior client service is also a weak differentiator in terms of its impact on client decision-making. In another survey of client organizations, we found that client service was the deciding factor in selecting a firm only four percent of the time. Contrast that with differentiation that is based on offering some type of specialized expertise, which was the deciding factor 71% of the time. Another thing to consider about client service as a differentiator is that it is rarely the driving reason that clients are looking for a new firm. In fact, when we surveyed companies seeking a new accounting firm, there were nine other factors that were more important to them than client service. This makes a lot of sense, because in every market I am familiar with, good client service has essentially become a given. 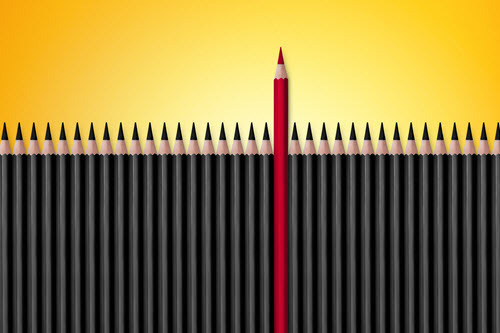 So, you may be asking yourself, “What else can we say about ourselves that is truly unique?” One of the differentiators that my firm has found most effective is differentiation based on the firm’s expertise. Specific roles within client organizations—such as consulting with CEOs, HR directors, etc. Remember, to be a true differentiator, a trait must be true, provable, and relevant. Whether you determine to set yourself apart based on a specific focus of expertise, or any of the various specializations listed above, you are creating a way for prospective clients to regard you as being in a different category than all the other firms that you compete with. This is not just an academic exercise, of course. It has everything to do with business development and growth. By investing the time and effort needed to identify the niche service, customized process or area of expertise, and then supporting it with messaging and content, you will be on your way to becoming both unique and highly attractive to your target clients. Want to learn more about increasing your visibility? Download our book, The Visible Expert.